2013 is now 1/6 complete, ready or not. 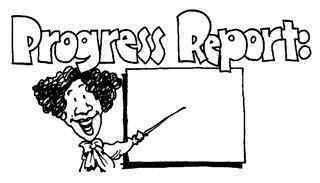 That means it is time for a progress report on the goals I set at the beginning of the year. My first post for 2013 on January 1 is where I shared 11 goals divided into the categories of body, mind and spirit. Reporting on my progress here helps hold me accountable. 1. Keep my weight at or below 150 pounds. All is well on this one. I still weigh in daily, and that weigh-in determines what and how much I eat as well as influencing physical activity for the day. 2. Walk/jog/run a total of 10,000 steps per day three days per week. I’m way ahead of schedule on this one, actually shifting to five days per week instead of three because I want to reach some rewards goals with my company’s incentive program HumanaVitality. I admit to doing a lot of jogging in place in front of the TV some nights to reach this goal, but that movement counts like any other. 3. Average at least six hours of sleep per night. I’m back on track with this one after a rocky couple of weeks in January. I don’t record numbers here, but more nights than not when I set my alarm, it’s for more than six hours from the time I’m going to bed. 1. Read a book every other week. Another couple dozen pages of book #4 this weekend and I’ll be up-to-date on this goal. I’ll read three and write book review blog posts of them in March to be where I want to be after the first quarter. 2. Blog every other day (at least). I’m two posts behind this schedule, so that will be easy to make up. It was nice blogging every day of my week at home last week to make up ground. 3. Continue to follow My 3 Words: Ground, Stretch, Reflect. This one still sneaks up on me because of not blogging every day like I did in 2012. It was actually easier getting into a routine last week and blogging every day than I’m finding it is to blog every other day. This one needs some work. Nightly blogging provided a built-in time for this reflection. Without that, I’m missing it too many nights. 4. Double the blog’s readership from 10,000 views in 2012 to 20,000. I’m thrilled at the progress on this goal. Through February, I’ve had more than half the number of blog visits I had all last year. I’m well ahead of pace to meet this goal with February being my best month ever and one day in February being my best day ever in number of views. Many thanks to the readers who join me on the journey! 5. Continue to write hand-written letters to my sons. Like I reported at the end of January, this is only done a couple of times a year, so having done it last in December, it will be a few months before I do it again. 1. Finish reading the ESV Study Bible and read half of The Apologetics Study Bible. This is on schedule. Even though I’m a few days behind in my readings, I read a little more daily than required to meet the mid-year goal for completion of the ESV. 2. Review 100 Bible memory verses weekly. So far, so good. This takes less than an hour weekly. 3. Come to some resolution to an unsettled situation where I worship. This was reported as complete in my report on Feb. 2. My week at home last week helped with a number of my goals. I’m planning at least one week at home per month for the foreseeable future, so those times can help me catch up a little if needed. I still use the low-tech approach of a little Post-It note with a checklist on the stand beside my recliner so that it’s near me nightly. It’s time to round out the first quarter now that March is here. I’d like to be completely up-to-date in all categories by the end of this month. Let’s see how I do!